Can cats actually hold the key to solving our anxiety? Home / Cats / Can cats actually hold the key to solving our anxiety? Take some time to cuddle with or pet your feline. Studies have proven that cats reduce stress levels and lower your overall blood pressure. The hormone oxytocin is released when we’re in the presence of a pet, which causes our happiness levels to significantly elevate. In addition, cats are usually staples of households, as well as hospitals, nursing homes, schools and more. Cats are there for you when you need them, considering you are their “human.” Cats express love by purring, licking your hand, “smiling” with their eyes, holding their paw in your hand and more. You can talk to them about your stressors, and they will listen. If you’re feeling overwhelmed and don’t know where to turn, you may want to talk to a mental health expert. Talk with someone on a site like betterhelp.com. You don’t have to leave your couch or your furry companion on your lap. Use your computer or phone and talk with someone about your stress and anxiety; it could ease your mind. Cats need someone to feed them and give them fresh water. Of course, this could sometimes mean that they climb on your stomach while you’re sleeping and meow in your face. They cry in higher octaves of meows to let you know that they need you to feed them. Having a ritualistic responsibility every day could help you get out of bed, especially if you’re feeling overwhelmed or depressed. Your cat will always need you — especially during times when they need to be reprimanded for knocking down the Christmas tree or digging their claws into everything BUT their scratching posts. Having one-on-one time with your cat can relieve stress. Whether your cat enjoys laser pointers, small stuffed mice toys, or a used makeup sponge stolen from your purse’s makeup bag, make some time to play with your cat. 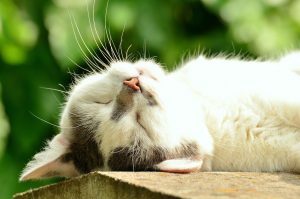 It’s good for your furry feline’s physical and mental health — and it allows you some time to relax. When you’re feeling anxious, physical actions can help immensely and take you away from what is going on in your head. Playing builds the connection between you and your cat. Chances are, you are very perceptive and think inwardly if you are feeling anxious. Sometimes, cats and other pets don’t outwardly show their stressors, but you will be more willing to notice them if you have anxious tendencies as well. According to petable.care, when your cat doesn’t eat, sometimes that could be related to a stressor. Is your cat’s eating place too loud (such as near the washer or dryer), too smelly (near the litter box) or in a high-traffic area (like a foyer)? You may begin to notice that the food bowl has barely been touched. While this could be because of food preferences or other health-related issues, it could also be because your cat just doesn’t feel comfortable with the spot. You will be able to take care of your pet’s stressors if you realized the triggers in your own life, too. #6 Can Your Cat Be An Official Therapy Pet? Your cat should be at least one year old, and you should know the cat for at least six months. Make sure your cat is comfortable in a harness. Keep your cat’s immunization records up to date. Make sure your cat has the personality to deal with people, loud noises and multiple situations. 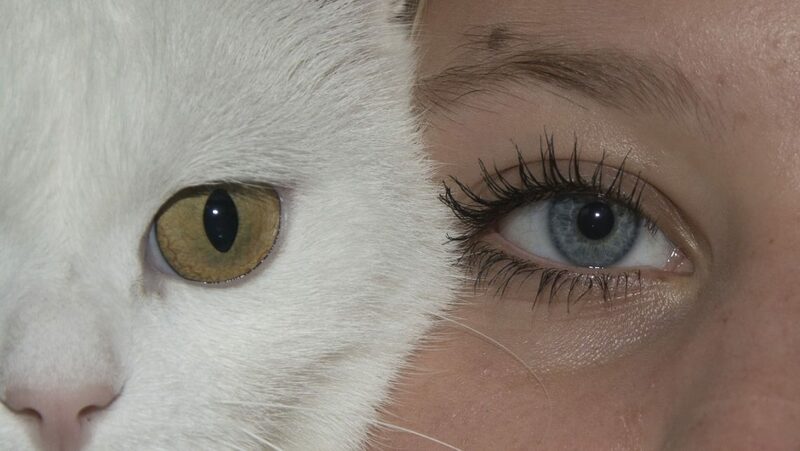 Overall, your cat should be friendly and non-aggressive toward people and other animals. Once you meet the organization’s requirements, you and your cat will take a training course. Experts will talk with you and evaluate your results. Then, after a trial period, your cat will be a certified therapy pet. You and your cat are now set to bring smiles and stress relief to those who need it. betterhelp.com. Accessed April 3, 2017. 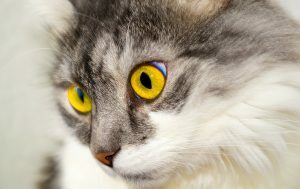 Cats As Therapy Animals? Here’s How To Get Your Feline Certified. Laura Moss. Mother Nature Network. Huffington Post. http://www.huffingtonpost.com/2013/08/30/cats-therapy-animals_n_3839529.html. Written August 30, 2013. Accessed April 3, 2017. Cat Eating Behavior: Why Your Cat Is Rejecting Food. Petable.Care. http://petable.care/2016/11/13/eating-behavior-thats-cat-rejecting-food/. Written November 13, 2016. Accessed April 3, 2017.